Red sand Dune is a popular desert area located 40km away from Phan Thiet center. It is well-known for red-hued sand dunes & activities such as sand sledding. The most popular time to see it is at sunset, when the amber sand radiates an intense fiery red; the effect is dramatic. 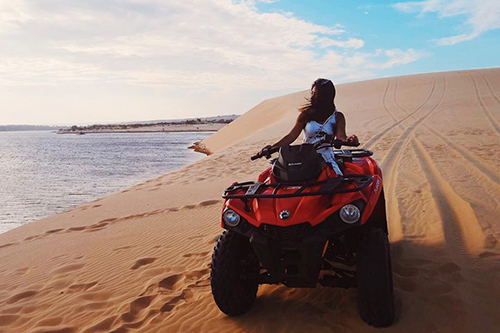 Coming to this Red-sand dune, besides sand sledding, take wonderful photos, riding quad-bikes over sand dunes is absolutely awesome things to do in Mui Ne that shouldn’t be missed in your trip here. This is an awesome things to do in Mui ne for adventure-lover. This game is not too hard but require the rider to get used to control the bike run through the sand dunes and overcome obstacles. Renting rate for 2 pax ranges from 350.000 – 850.000 VND( around $17-40) depending on the duration from 20-60 minutes. The second most popular time is at sunrise, and early birds are rewarded with cooler temperatures. You may have the dunes to yourself in the middle of the day, but it would be an absolute inferno. 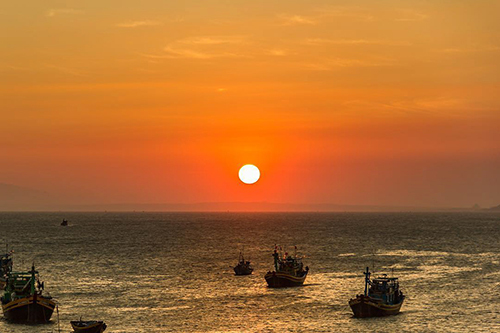 Located in the South of Phan Thiet, Ke Ga lighthouse is must-see destination for adventure lovers. This 1897 stone lighthouse atop colorful rock formations, overlooking the ocean & white beaches. The reason for its name is that the lighthouse is situated on a promontory 500m with its shape like a chicken. There is still not so many people realizing the attraction of Ke Ga Lighthouse, an interesting new tourist attractions in Phan Thiet. This tourist attraction is attracting tourists who not only love to discover a unique architectural work but also would like to relax amidst the charming romantic natural landscapes. Standing at the Ke Ga Lighthouse in the sunset, you will truly enjoy the unforgettable feelings. 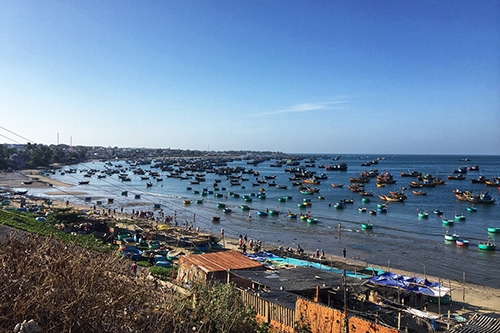 Visiting Mui Ne market in the early morning will provide you a fascinating sneek into the lives of local Vietnamese fishermen. Every morning they get their catch to the shore. Their wives and family members sort out the catch and sell it to the local traders, restaurant owners, and street food vendors on the spot. Expect to find fishing nets full of seafood, buckets overflowing with fish, shells strewn everywhere, raucous conversation, and plenty of photo-opps. Mui Ne and Phan Thiet boast of a number of windy beaches that are perfect for kite surfing. In fact, the area is one of Asia’s most popular sites for kitesurfing. There are a number of Kite Surfing schools in the area that offer courses for amateurs and beginners at extremely competitive prices. Moreover, there is no shortage of wide, sandy beaches to practice the sport. 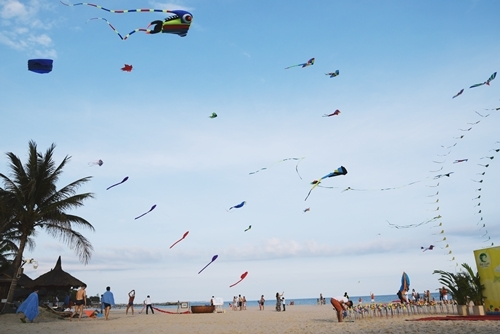 In the summer, you will easily encounter with colorful kites flying over the blue sky near Mui Ne beach. This is one of the most fascinating things to do in Mui Ne that attracts both kids and adults. You can rent a kite with different shapes at various rates. The main beach, Mui Ne Beach, will be busy in the morning from the kite and wind surfers but is quiet in the late afternoon and evening. Hon Rom beach is more north, after the red sand dunes and is popular among Vietnamese tourists. Suoi Nuoc Beach is more popular with westerners and has that perfect white sand, it is also just after the red sand dunes. 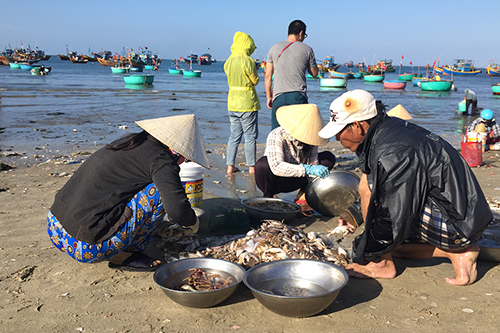 During progressive time slots between late April and the following February, adult squid can be found in almost all waters of the Mui Ne Bay. Because a boat isn’t needed and jigging equipment is reasonable, squid-jigging is one of the most inexpensive ways to catch squid. Anglers should take a camping lantern or flashlight of significant size for unit locations. 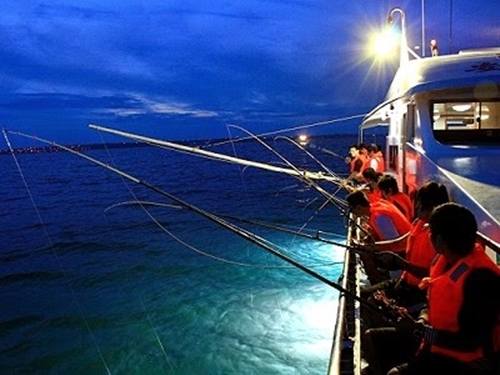 An all inclusive squid fishing tour in Mui Ne would be 700,000 VND/pax.